In a corner at beautiful Santorini and precisely next to the sea we created with lot of love and taste the rooms "Stella" and the tavern "Dimitris". 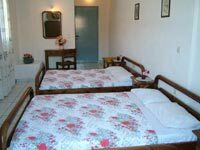 Our group provides comfortable and spacious rooms capable to entertain from 2 until 4 persons. All the rooms, have all the modern comforts, air-condition, television, comfortable wardrobe, bathroom and shower. They have also comfortable and spacious verandas, with view to the immense light blue of the sea and for the nature lovers view to the unique beauty of virgin nature. Our rooms get cleaned every day and you can have option for breakfast. There is also a big swimming-pool and comfortable space for parking. The bus station is precisely next to our rooms. We can help you find to rent of car or bike or what other you need. We are only 10 minutes from the harbour and from the airport and we are in the best strategic place for your campaigns to explore the island. 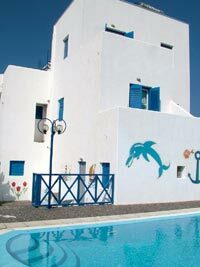 It is also only 10 minutes from Fira, the capital city of Santorini island where you can make your night roamings. We are waiting for you in order to provide you with carefree and unique vacations in a quiet, familial and friendly environment and we promise to contribute as much as we can to make your vacations unforgetable.